Everyone likely has a few photos sitting on their iPhone they’d rather nobody else see, whether it’s embarrassing selfies, poorly filtered or edited pics, a picture of a receipt or personal paperwork, or anything else in the realm of private photos. Those pictures can make showing someone another picture on your iPhone (or iPad) an awkward experience, as you’re hoping they don’t start flipping through your Camera Roll to discover that terrible photo of you after winning the pie eating contest. Fortunately the newest versions of iOS include a new way to mitigate that potential awkwardness by hiding select photos. 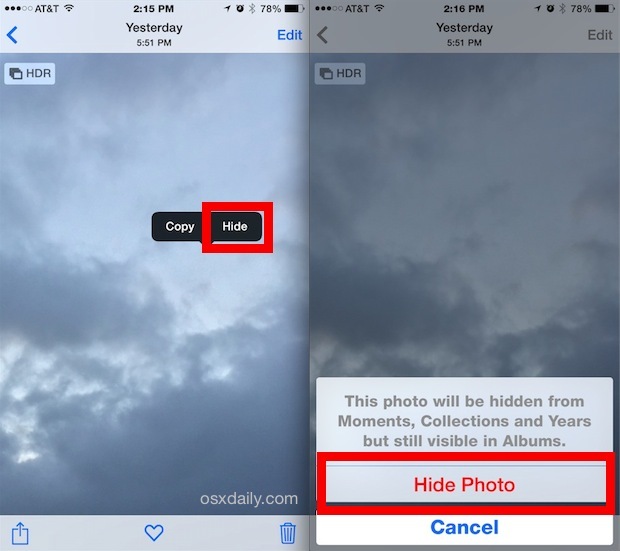 The photo hiding feature must be enabled individually for each picture, as it’s set on a per-image basis. At the moment there is no bulk hide function like there is with the ability to bulk remove a bunch of photos all at once, so you may want to get in the habit of regularly hiding the pictures you don’t want to show up in your general photos app views. Note this feature is available only to iOS 8 and newer, and though we’re going to focus on the iPhone here, it works the same on the iPad and iPod touch too. Note there is a subtle difference in accessing the “Hide Photo” feature in newest iOS versions versus older iOS versions, the rest is the same. 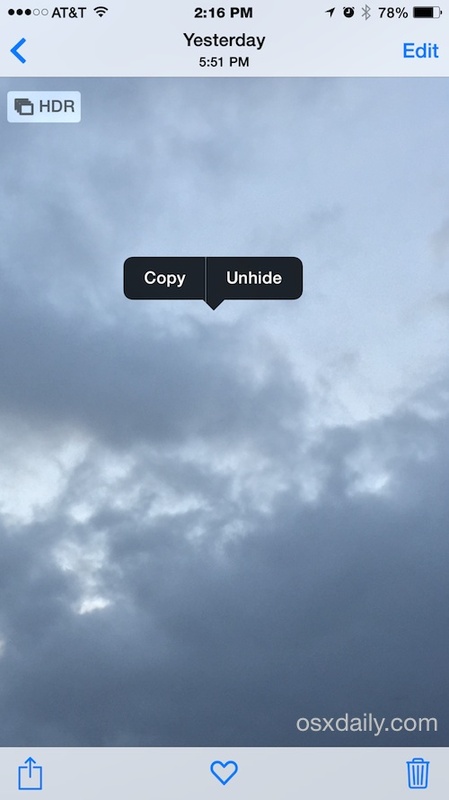 Nonetheless you can perform the Hide Photo function on any vaguely recent release on iPhone or iPad. Now that a picture or many are hidden, they’ll become invisible to the Collections, Years views, and instead are placed in a separate “Hidden” album. This is where all of your hidden photos will be stored. Note that while a picture is hidden, it can still be shared or sent through messages as usual, as long as you access it from this hidden album. This sends the picture back to the general Camera Roll and it becomes accessible to all albums and collections views again. It’s important to understand how the hide photo function works: the photo(s) are hidden from the camera roll, Moments, Collections, and Year view, but are still visible in a photo album not-so-discretely called “Hidden”. 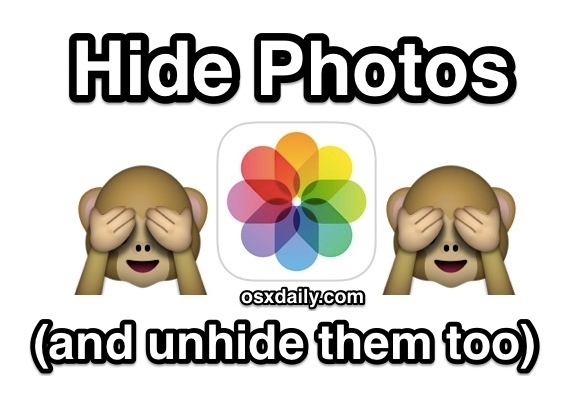 In other words, while this is very effective at hiding photos from casual iPhone use and from flipping through your pictures in iOS, anyone who knows to look for the ‘Hidden’ album can still view the hidden images. This is a decent way of handling your truly private pictures, but if you’re concerned about someone discovering the Hidden photos album, consider using the send-to-self trick to avoid offering photo album and camera roll access, or maybe just message them the pictures instead. Enjoy this? Don’t miss our tons of other Photos app tips. Hmm yea that’s not how it should work. 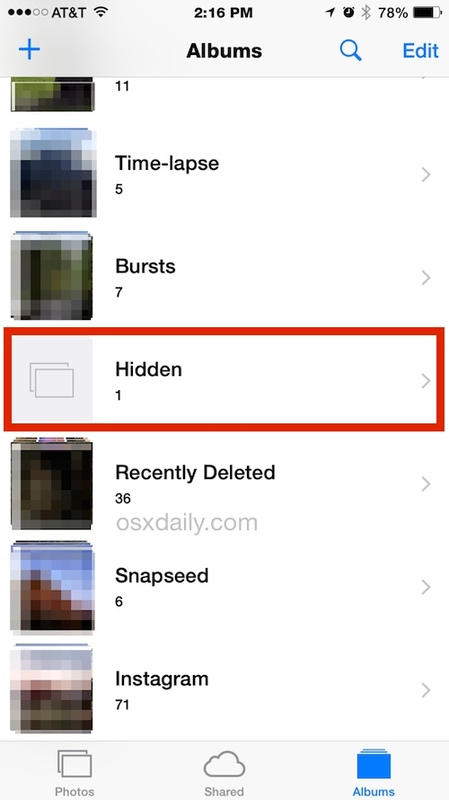 Here is how hiding pictures on the iPhone should work: the hidden folder should hide photos from ALL other albums and camera roll, AND be password protected (or Touch ID protected). Imagine having a password on your private pictures and movies stored on your iPhone – no more worries! Cool idea, huh? This is EXACTLY what I was thinking on how it should work! The photos should disappear from “All Photos” kind of like they’ve been deleted, but appear in the “Hidden” photos for which you then choose a password which no one else would know. Then the photos would actually be hidden. eh, it’s because you should not try to save pennies by your private photos. just look at the hollywood stars, who saved their photos in iCloud – what came of it? you must use professional apps, which can encrypt your data. The “Hidden” album is not really doing it’s job. It’s better to use professional apps for hiding pics. I use Keeply app. It hides photos perfectly. Not much good if you can still see the photo – not really hidden is it? Doesn’t hide them in camera roll. Only in years, collections, and moments. Would be cool if it worked like Pablo said and also pulled them from photo stream. Yeah – not in my case. I’ve been playing with it about an hour. The camera roll is showing everything in the hidden folder. And if delete from camera roll; it’s deleting from hidden photos. If anyone is reading this that can do something about it, please remove hidden folders from the camera roll on the next update. What I do to keep my private pic private is copy and paste them into a tab in notes. Then I delete them from my stream and deleted pics folder. When I open up the note I can share the whole note with someone or just select a single pic to share. I like using notes bc I still have sharing abilities and no one will ever find these pics through my albums. This idea was great! This is what I did and once I delete the photos from my phone they still stay in that note. Thanks! Ha ha stupid IOS owners buy a better phone…… samsung! Doesn’t hide them from photo stream so anyone picking up my phone (ie my kids or anyone I’m showing a picture I just took) can scroll and view. Very disappointing. Has to be a better way. First, Apple Supports ‘instructions’ on how to hide photos on iPad are wrong (as they so often are). Here’s how: tap on the photo to open it, CLICK THE RECTANGLE WITH THE ARROW POINTING UPWARS (as if you were going to send the photo by email), only THEN does a menu appear at the bottom that includes the ‘hide’ function. Tap this and a confirmation request appears in the top right corner as usual. Secondly: of course the hide function is useless. If you REALLY want to hide photos – get the PhotoVault app. It’s free and works perfectly. You can also download stuff from the web directly into ihis app, and the download won’t show in your web history. Neat, huh? I had this problem for a long time. I am skeptic with this king of tools but I was wrong. This tool can do anything. you can hide your private photos by simply tapping ‘edit’ and cropping it to somewhere there is blank. viewer will think its a blank photo. if you dont understand this idea.. I figured it out. As Paul said download the photo vault app “my media” then after you set the passcode open the folder with your photos in it, i.e. Your gallery then select the photos you wish to hide. Then go back to your camera roll and delete all the photos you hid. Now be sure to open the “recently deleted” folder in albums and re-delete the photos permanently. Enjoy your now securely hidden files. Its not working. When I click on the picture it just zooms in. Please help! Samsung is the way to go. Hidden pics are password protected! Samsung is way better at hiding photos! They have a private profile that stays private until you enter your four digit pin. Really wish Apple would do the same! Hiding stuff from the nephews on my phone will be very difficult now that I have switched from Android to Apple. There are several apps that are password protected for hiding sensitive images or photos of sensitive data. I use Don’t Touch This and PhotoSafe. I keep tapping and holding my photos but this copy/hide menu doesn’t come up! What am I doing wrong? I’ve tried it with over a dozen pics and NONE of them give me this option. Can you have two “hidden” folders? Not what I call hiding a picture. It just means that whoever access your phone will take a little longer to find it. Pointless.